Pat the turkey breast dry with paper towels. Whisk the melted cooking fat with the sage, rosemary, thyme, lemon zest, lemon juice, and sea salt to combine. Massage the herb rub over the entire turkey breast. Place the turkey breast-side down on a rack in a roasting pan with the top-facing portion covered loosely with foil. Bake at 325 F for one hour. Remove from oven and carefully flip over so that it is now breast-side up. Turn oven up to 400 F and return the turkey, uncovered, for an additional 30 minutes. Remove from oven and place a meat thermometer in the thickest portion of the breast. When the breast reads 165 F, it’s finished. If it’s under-temperature, return to the oven until it reads high enough. When the turkey is at temperature, let it rest on the counter covered loosely with a foil sheet for 15 minutes before carving. 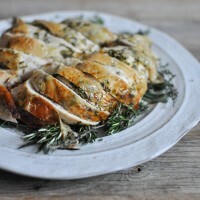 Give the turkey breast about 2 days to thaw completely in the refrigerator. Baking the turkey breast-side down for the majority of its time in the oven helps keep the breast meat moist and tender. If your turkey starts to brown too quickly when it’s breast-side up, just cover with a loose sheet of foil. If the bottom of your roasting pan starts to smoke, just add a few tablespoons of cooking fat.